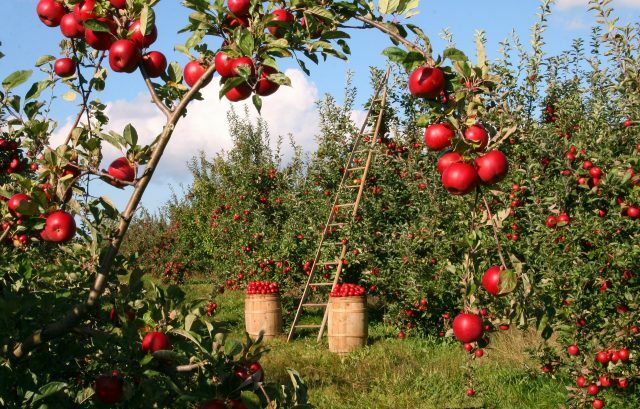 As I sit within the power of my mind an image of an apple orchard comes to me. I was contemplating the embracing power of light and for no apparent reason the image of an apple orchard appeared before me. What is the connection when I was focused on the expanding light that comes forth with each breath we take? From experience I know not to discard this image that quickly or to overlook its importance. In one of Alice Bailey’s books entitled, Ponder on This, printed in 1971, she and the Tibetan Master, Djwhal Khul list a myriad of subjects that the student of their works should ponder. My inner sense tells me that I should ponder the image of the apple orchard to gain a greater understanding of its relationship to my thought about embracing the light. Somewhere in time a seed was planted to bring about the first apple tree. Its original design comes from the cosmic order of creation. As the seed sent out roots it also sent out a piece of itself, to accept the light from the sun. In its inner blueprint it knew that the soil of the earth and the rays of the sun would allow it to grow. It felt in its inner nature the course it had to take to survive. As it grew upwards it welcomed all the blessings of nature. The wind, rain and varying temperatures. As it grew it understood that there was more to it than just its roots, trunk, branches and leaves. It sensed that it was to produce something of importance. It produces a replica of itself. It produced other apples and within those apples were the seeds to continue its line of creation. Before long the seed of the one plant became the orchard that appeared as an image to me. The apple orchard is a symbol of who and what we are. We came from an original thought. Our seed understood what it took to align ourselves with the nature of things to survive. Our ancestors brought forth their concept of who and what we were and are. The apple tree is statuary but its fruits move throughout the land and nourishes us while creating additional trees. We have been given the ability to move and to think. Our fruit is the results of our endeavors on earth. We are not earth bound, like a tree, but we are the stuff of earth and so much more. The light that has helped us grow and function does so in ways we are only partially aware of. When we look at the orchard, we see an abundance of apples. Each is unique with a similar appearance but the seed still brings forth the tree that bares the fruit of its design. We can look at an apple orchard and see the similarities. When we look at one another do we have the ability to see and appreciate our similarities or do we continue to dwell on what makes us different? The embrace of light does so without regard for our differences. It is time for us to see one another in a new light. I don’t just think so, I know so.